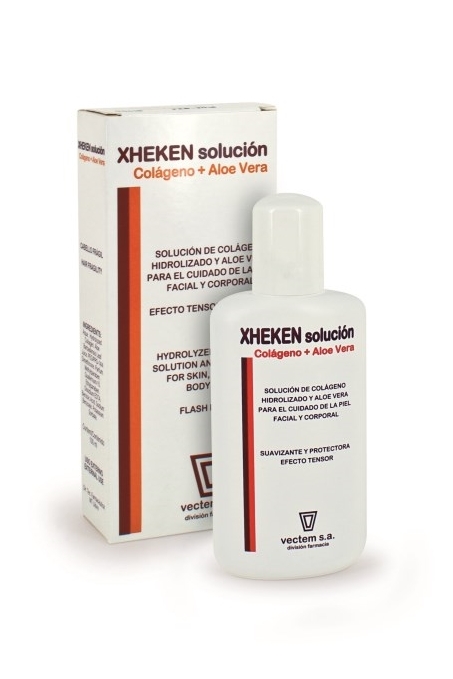 XHEKEN SOLUTION , vectem s.a.
HYDROLYSED COLLAGEN solution enriched with moisturising, soothing and decongesting ALOE VERA, for FACE & BODY skin care. Relieves skin congestion and redness caused by sun exposure, waxing, shaving, minor burns, etc. Protects the skin from dehydration, promoting its regeneration and maintenance. Recommended as a make up base for women and as an after shave balm for men. Also suitable to repair and strengthen brittle, stressed and lustreless hair. Protects the hair, leaving it soft and smooth.